With all the talk about smart technology and connected homes the process may seem complicated and expensive. However, that does not have to be the case. There are some simple and surprisingly inexpensive options available on today’s market. Both Legrand N.A. and Lutron Electronics offer reasonably priced, easy-to-install automation products designed to make your home more comfortable, convenient and safe. In many cases it just takes some simple retrofitting of an existing dimmer switch to give you the ability to control your lights, window shades and other electronic devices with a remote, tablet or smart phone. Home automation apps make it a snap to change your room into the perfect setting for movie night. For added ease, Lutron’s Caseta Wireless system can be integrated with Apple, Amazon or Google platforms. Imagine simply asking Alexa to turn on your inside and/or outside lights before you get home. That’s a welcome home. Homeowners today are personalizing their space by mixing and matching fixture collections and finishes throughout their homes. As consumers become more sophisticated and aware of various styles, they are gaining the confidence to create their own look by blending designs, shapes and finishes without relying on traditional rules of limited divergence. In keeping with consumers’ desire to mix it up, lighting manufacturers are coming out with fixtures that blend materials together to create a vintage look. One popular trend is fixtures combining brushed nickel and graphite for an updated, traditional style that can comfortably mingle with industrial design. Also new is the curated trend, created as a way for consumers to reflect their dreams, even if they have not yet reached the life plateau to which they aspire. 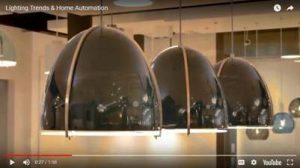 For more about the curated trend, as well as mixing and matching materials and styles, take a look at Progress Lighting’s new video about current trends in lighting. Have you checked out the 2017 issue of Lighting magazine? If not, stop by your local Hortons Home Lighting for a free copy. 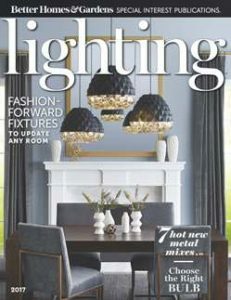 The beautiful, full-color magazine, produced by Hortons Home Lighting and Better Homes & Gardens, shows everything new in lighting, including how to make your home the kind of showstopper you want it to be. The magazine shows how to make a big change with a few small steps as well as how to find the right fixture for your style and decor. With tips from the pros and photos of the latest lighting products, it’s the perfect resource for home lighting and design inspiration.